So if the #16 crossed the line in 10th, what the hell happened? 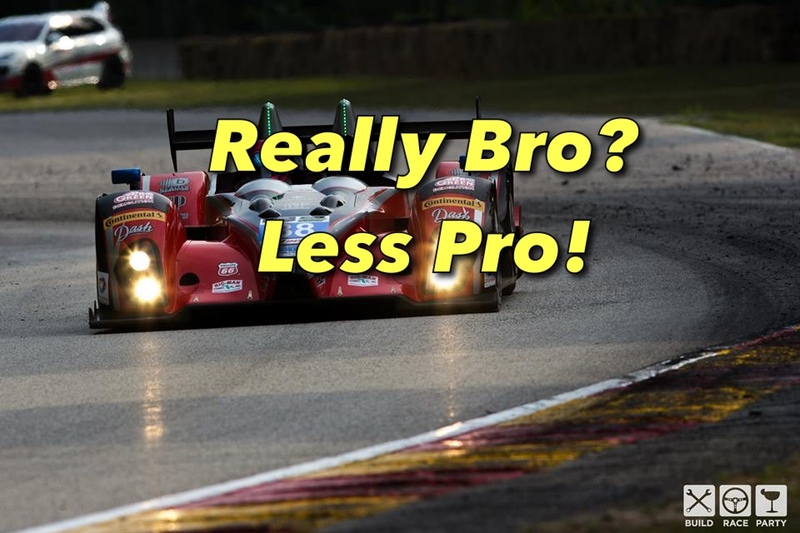 You need to understand the Tudor United Sportscar Championship. Especially the Pro Am classes(which might be all of them? I tried to figure it out and got lost). But it's not designed for professionals. It's designed for crazy rich privateers who pay the bills. Like club racing with a tv package and really expensive cars. So if the amateurs don't drive enough, then the teams result doesn't count. If the pro doesn't drive enough, no one cares. It's all dependent on the amateurs seat times. And the 16 wasn't the only car. The No. 94 in GTD class also had one of its pro-am driver miss the minimum drive time requirement and lose its points, and prize money as well. The International Motor Sports Association (IMSA) today announced the No. 16 Prototype Challenge (PC) team and drivers Johnny Mowlem, Tom Papadopoulos, Tomy Drissi, Brian Alder and Martin Plowman have lost their 10th place finishing position in the 2015 Rolex 24 at Daytona. The pro-am PC class requires bronze- or silver-rated (amateur) drivers to meet minimum drive times to be eligible for points and awards. In the case of Daytona the minimum was four hours and thirty minutes for the PC and GT Daytona (GTD) class. The No. 16 Autosport Designs/Southwest Realty Advisors/SpongeBob [The Movie] prototype challenge car used two platinum drivers in its Rolex 24 lineup, the team needed two silver- or bronze-rated drivers to each to meet the minimum drive-time requirement. Only one of the team’s silver- or bronze drivers met the minimum. As a result, the No. 16 team loses its finishing position, prize money and all points except for the one point awarded for starting the race. I’m with you mate, the pro’s didn’t over-clock their time so technically the car had a legal amout of Amateurish driving (I’m sure I could find a better term for that) so where is the REAL harm here? Why can’t they get the same deal as the #10 DP and get points for last place? if anything their infringement was more of a concern due to the fatigue related safety concerns. ← Previous Post: Fire System: Are You Doing It Right?